Marilyn Hayes Phillips’ new book A Wild Olive Shoot ($11.99, paperback, 9781545605196; $5.99, eBook, 9781545605202) is a painfully honest memoir that traces the author's rural beginnings to international business success, but a life based on lies and lived for herself, until guided by Jesus Christ that brought true joy and peace. This book contains a fascinating depiction of an interesting life, one that spans rural dirt poor Minnesota beginnings to life in Hollywood with a paranoid-schizophrenic actor husband to business success as a marketing manager in Italy. The author shares that alignment with God's purpose for one's individual life, and accepting the peaceful submission to the truth of Jesus Christ is the sure way to true joy in this earthy life. Marilyn Hayes Phillip’s went from a one-room schoolhouse education to Marketing Director at a large U.S. corporations and Strategy Director at leading international ad agencies. Xulon Press, a division of Salem Media Group, is the world’s largest Christian self-publisher, with more than 12,000 titles published to date. 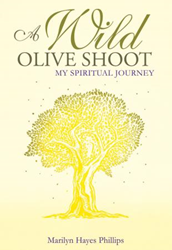 Retailers may order A Wild Olive Shoot through Ingram Book Company and/or Spring Arbor Book Distributors. The book is available online through xulonpress.com/bookstore, amazon.com, and barnesandnoble.com.